Forget Van Gogh, Munch and Michelangelo. When it comes to artists, there’s only one choice for slot developers, Leonardo Da Vinci. The renaissance master stars in Da Vinci’s Treasure, the latest slot from Pragmatic Play that has just gone live. A dozen free spins are awarded in the Progressive Multiplier Free Spins feature – this lives up to its name with the starting 1 x multiplier increasing by 1 with each free spin. Hope to land a re-trigger here for even more free spins and multipliers. You an get up to 60 free spins with a 60x multiplier on your last one! Finally, there’s the Prize Picker feature which is a variation on the old favourite, the pick me round. Simply choose from the 3 objects shown to reveal a cash prize. All 3 features are triggered by landing the scatter on reels 2, 3 and 4 on the same spin. Then spin the bonus wheel to see which round you’ll go on to play. What you want is the Progressive Multiplier Free Spins feature as the potential 60th free spin with a 60x multiplier can pay out 48,000 times your total stake! The design in Da Vinci’s Treasure is perfectly solid but you’d be hard pushed to call it a masterpiece. With a treasure map in the background, you’ll see royal values plus a selection of mystery books, crossbows and knapsacks. The most rewarding symbol is the treasure seeker John Hunter who’ll get you 32 times your stake if you land 5 in combination. Da Vinci’s famous paintings might not be on display in this slot. It’s still a very playable game though thanks to the range of features on offer and the super high variance. If you enjoy slots that offer high risks but potentially spectacular rewards, then this quest for Da Vinci’s Treasure is one that’s well worth making. 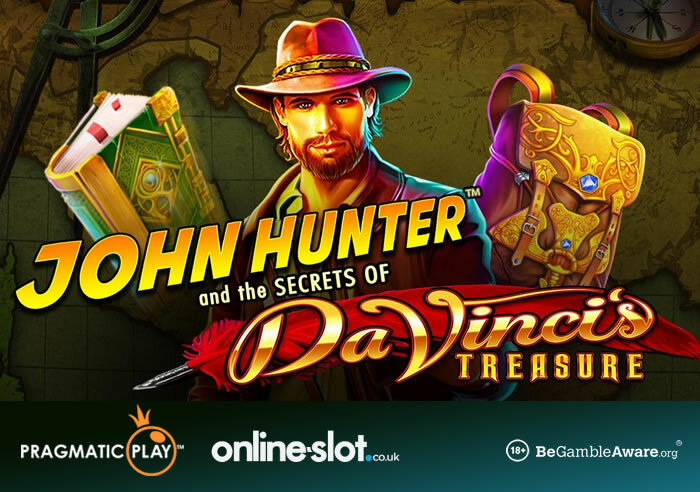 Da Vinci’s Treasure can be played at Mr Green Casino – they have lots of new slots like Play ‘N Go’s Street Magic, Just For The Win’s Sidewinder and Quickspin’s Big Bot Crew. Sign up to get an exclusive 20 no deposit bonus spins on NetEnt’s Starburst. On your 1st deposit, you will be met with a 100% bonus up to £100 plus 100 more bonus spins on Starburst. You will then get 5 bonus spins for 20 consecutive days on various slots.